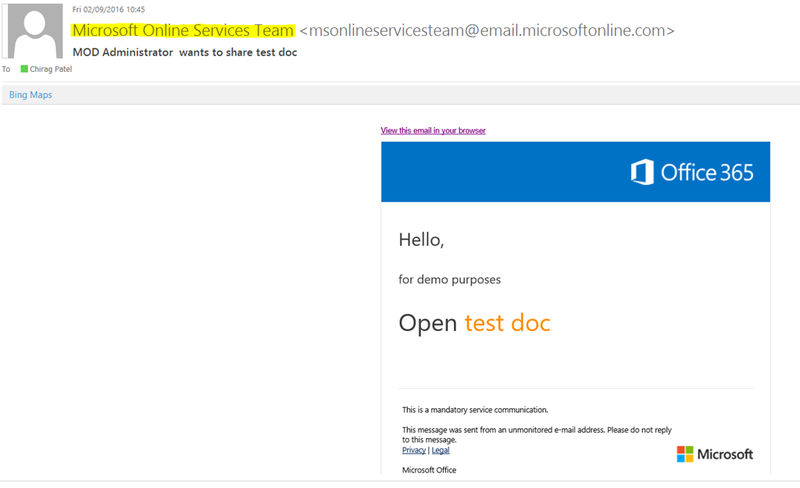 Currently, SharePoint Online and OneDrive for Business send external sharing invitations via the Microsoft Online Services Team address (which is generic and difficult to identify which site is from). Starting today the external sharing invitation emails will now be coming via the Exchange Web Services. Sharing invitations will now come from the sharing users mailbox or a SharePoint owned “No Reply” address. The main reason for the above change was to resolve the confusion and helping users find email based on SharePoint team site name or an individual’s name from OneDrive For Business. You can find more information on how to manage external sharing for your SharePoint Online environment. Chirag is an Independent Consultant at Patel Consulting, Chartered IT Professional, TOGAF9 Certified Architect and Microsoft Certified Solution Expert (Productivity, Data Platform) based in London, UK with more than 15 years of industry experience. He works with a wide variety of clients in many sectors, designing and implementing business collaboration, data and information management solutions and services based on SharePoint and Office 365 technologies to create business value for both themselves and their customers, including UK Microsoft Gold Partners with deployment, upgrade and migration services delivery. Chirag is an active SharePoint community participant, frequent speaker at local and international events including SharePoint Saturdays and Collab365. He is also one of the co-organisers of the SharePoint User Group UK (London) region. In 2011, for his valuable contributions to Microsoft TechNet forums he received a Microsoft Community Contributor Award. In his little spare time he enjoys cycling, cricket and every year participating in Charity bike rides and Duathlons. You can find him online at www.techchirag.com and follow Chirag on Twitter at @techChirag. The posts on this weblog are provided “AS IS” with no warranties, and confer no rights. The opinions expressed herein are personal and do not represent those of my employer.